There is little but tradition regarding Freemasonry in North America prior to 1750. Setting aside an enscribed stone dated 1606 from Goat Island, Nova Scotia; ambiguous Plymouth County records from 1654; and the Rev. Edward Peterson's claims for a Rhode Island lodge in 1658, the first reference to a freemason in North America is Jonathan Belcher, born in Boston in 1681, who was initiated into an “occasional lodge” while travelling in Europe in 1704, making him, upon his return to Boston in 1705, the “Senior Freemason of America”. From 1721 there are newspaper accounts of masonic affairs, implying that Freemasonry was of public interest and that there were freemasons in the colonies. A number of members of the lodge meeting in King's Chapel, Boston relocated to Nova Scotia after 1713 and may well have held occasional lodges in their new home. The brethren who met in Philadelphia left an account book, now known as “St. Johns Lodge Libr B”, beginning with June 24, 1731. In the archives of the American Philosophical Society at Philadelphia is a volume entitled “Benjn Franklins Journal, began July 4, 1730”. It is an account book containing an entry for September 9, 1731 referring to the “Lodge of Masons held at B. Hubard’s”. Bro. John Hubbard kept Tun Tavern, where the lodge met. “...it is now generally agreed that there were Freemasons in Annapolis Royal soon after its capture , and that they came there from New England.”6 There are no extant records of them meeting in lodge. 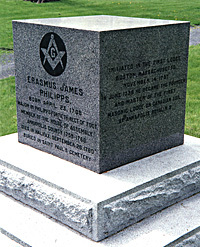 Erasmus James Philipps (1705-1760) was made a Master Mason in Boston on 14 November 1737. Henry Price appointed him as Provincial Grand Master over the Free and Accepted Masons in the Province of Nova Scotia sometime prior to 13 March 1738. 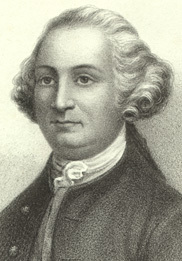 Philipps returned to Annapolis Royal in June 1738 and shortly thereafter constituted his first lodge. The earliest Scottish lodge warranted in Canada, St. Andrew's Scots, Quebec, first met in 1819. Mindon Lodge In H. M. 20th Regt. (Kingston, U.C.,) had held a field warrant from 1748, but the first lodge warranted in Canada by the Grand Lodge of Ireland was in 1841, when a warrant was issued to St. John's Lodge at London, Canada West. It was not until 1855 that the Grand Lodge of Canada (now the Grand Lodge of Canada in the Province of Ontario) was constituted. These are the bare facts of our early history. It is possible that any number of unwarranted or occasional lodges, and military lodges working under travelling warrants, met in North America prior to the dates given here. Further discovery of lodge records and the like is always possible, but until their discovery, Freemasonry can make no earlier claim. 1. Bufford’s lith. Boston. By-laws of Henry Price Lodge, Charlestown. Constituted, June 22, 5859. Boston : Calkins & Goodwin, Printers, 136 Washington Street, 5866 , frontispiece. 4. Early History, Grand Lodge of Pennsylvania, 1877. p. 4. 6. A Short History of Freemasonry in Nova Scotia 1738 - 1966, Ronald S. Longley. Halifax : The History Committee, 1966. [133 pp.] p. 7. 8. Coil's Masonic Encyclopedia, Henry Wilson Coil. Richmond, Virginia : Macoy Publishing & Masonic Supply Co., Inc., 1996. [734 pp.] p. 156.